Consuela and I had arranged a trip to Kefalonia to volunteer our work at ARK. We were looking forward to helping the many beautiful and friendly dogs and cats and seeing all our Greek friends again. It was not our first volunteering trip so we knew that we were going to be busy and very happy. 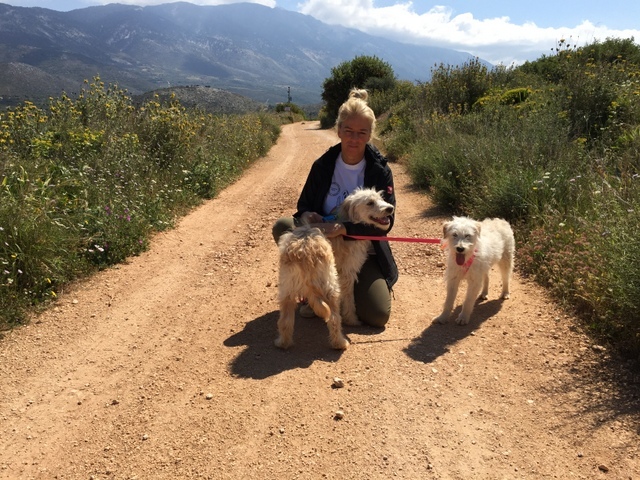 One morning during the daily routine of cleaning, feeding and watering, Marina received a telephone call to say that two dogs had been found at the side of a road. The caller said they had clearly been abandoned and were in need of shelter. 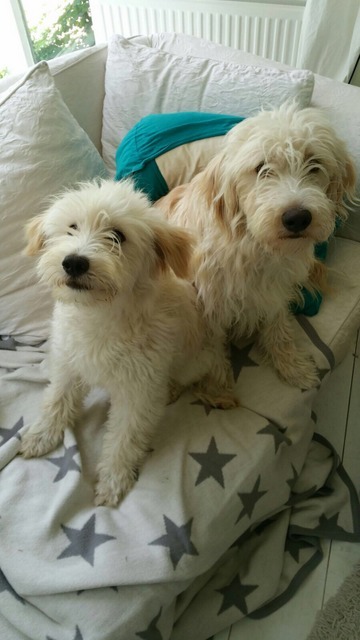 Marina offered to take the two abandoned dogs and gave the caller directions to the shelter. One of the ‘Whities’ being cuddled by Arno. As Marina did not know what the dogs were like and how they would react with the other residents of ARK she asked me to make an enclosure ready to receive them. Of course, I was delighted to help – I knew from my previous volunteering periods at ARK that meant a lot of work. The enclosure was made ready to receive the new residents, it was cleaned thoroughly (no short cuts it had to be 100% clean), new white stones on the floor, water bowls filled and food bowls. Just two hours after the telephone call a car arrived at ARK and came to a stop just outside the kitchen area. I opened the trunk of the car and what we saw inside bought tears to our eyes. Volunteers at animal shelters see a lot of sad sights and this was one of those. Inside the trunk were two little white dogs, scared and hungry; it was a heart breaking sight. We gently picked up the little dogs and took them to their new enclosure. As we placed the little dogs in the enclosure and it became apparent that they were siblings. A brother and sister who we estimated to be around six months of age. The little ones were afraid but we made them comfortable. The next week was wonderful for Consuela and I. 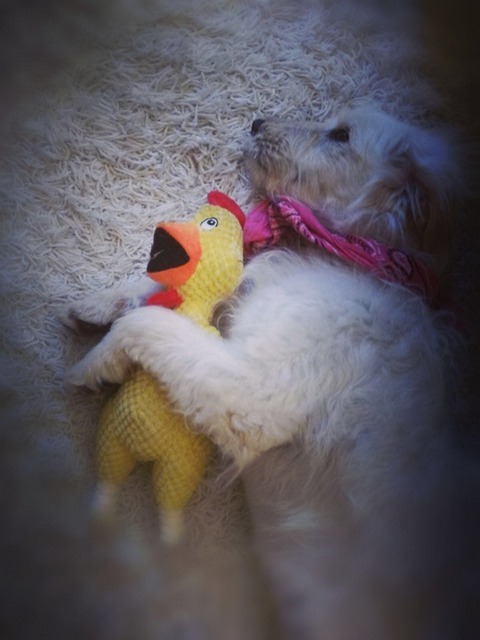 We spent a lot of time with the two little ones, playing with them and giving them a sense of security. Experience had taught us that it would take time and patience for them to feel secure again. It was a task we were only too happy to take on. The day arrived for us to return to Holland too quickly. It was not easy leaving our new little friends, but we made them a promise. That day we promised to find them a forever home and that they would stay together. The two little ones didn’t have names by the time we left. We called them ‘Whities’ because of their colour. Everyday at home we thought about the ‘Whities’; we missed them so very much. 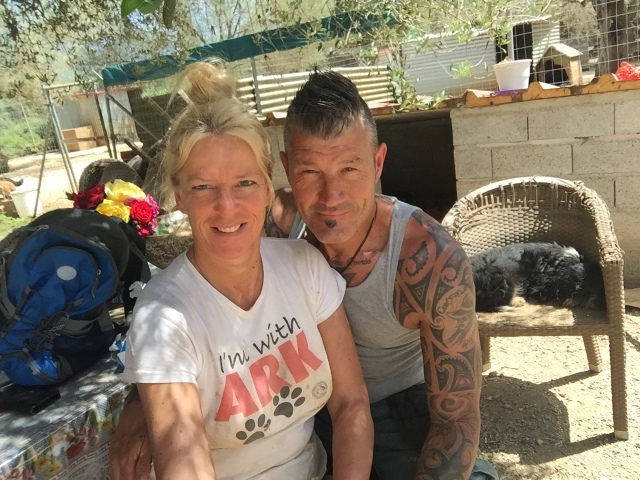 Consuela and I have long been supporters of ARK and a while ago created an ARK Holland Facebook page which we use to raise awareness and funds. We decided to post photographs of the ‘Whities’ on our Facebook page in the hope that someone would want to adopt them. We promised had them a home. It was early February when we had our first contact with Raguel and Rodriquez who had a few questions about the ‘Whities’. Raguel and Rodriquez were animal lovers and they had shared their lives with two dogs for many years. Sadly both of their dogs had passed over the rainbow bridge and their home was quiet and empty without them. They saw the photographs of the ‘Whities’ and an idea started to take shape. Within two weeks of our initial contact Raguel and Rodriquez had decided to adopt both of the ‘Whities’. We were overjoyed, what happy news for us and fantastic news for the two ‘Whities’. Raguel and Rodriquez had even chosen names for them; NAVI for the little boy (from the movie Avatar) and NESKA for the little girl (Neska is Spanish for ‘little girl’. What a cosmopolitan family they were going to be, Rodriquez is Spanish, Raguel is Dutch and Navi and Neska are Greek! One small problem, there were no direct flights to Holland at that time. Together with the ARK team we called Madeline and John Nineham and asked if they could act as foster parents. They kindly agreed to take Neska and Navi into their home for which we were and are so grateful. Madeline and John not only acted as foster parents they arranged the vaccinations, neutering and passports for the two little ones. We booked seats on the first direct flight to Kefalonia (late April), we were so excited. We wanted the pleasure of escorting Neska and Navi to Holland ourselves. Of course, being in Kefalonia it was only natural that we went to work at ARK! Every day we made our way to the shelter to help Marina, Joyce and Gill care for the animals. We also managed to spend a lot of time with the ‘Whities’ , Neska and Navi. Together we went walking and took trips to the beach. It was sheer paradise, for us and the dogs. It was the best time ever! On 28th April 2017, four months after we first saw Neska and Navi, we are taking them with us to Holland. One of our happiest days ever. Rodriquez and Raguel were waiting to greet us at the airport. There were many tears when Neska and Navi were united with their new family. 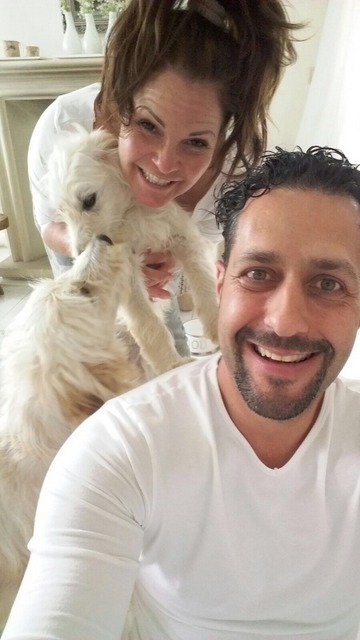 The tears were from joy and happiness; who would have believed that the two unwanted, abandoned little puppies we met four months ago would become Dutch citizens with such great adoptive parents. Consuela and I are very fortunate in that Neska and Navi live about 20 minutes away from our home, which means that we get to see them frequently. 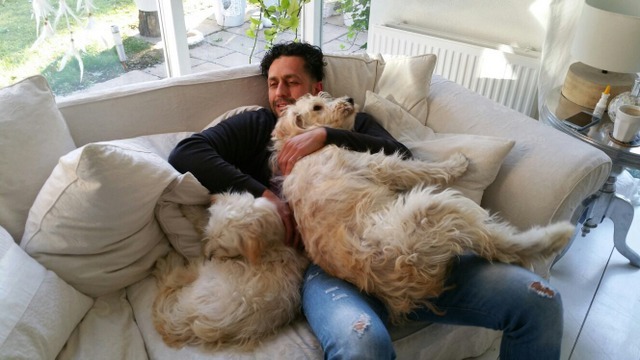 They are such happy dogs, they could not have found a better home than the one they share with Rodriquez and Raguel. Neska and Navi, formerly the ‘Whities’ now live in a lovely home with a big garden which they enjoy playing in. Neska and Navi love nothing more than a cuddle on the sofa! A successful adoption – team work! We thank the ARK team who gave Neska and Navi a safe warm place after they had been abandoned. We also thank Madeline and John Nineham who fostered and prepared them for their journey to Holland. To everyone involved in making this double adoption possible we give our thanks. 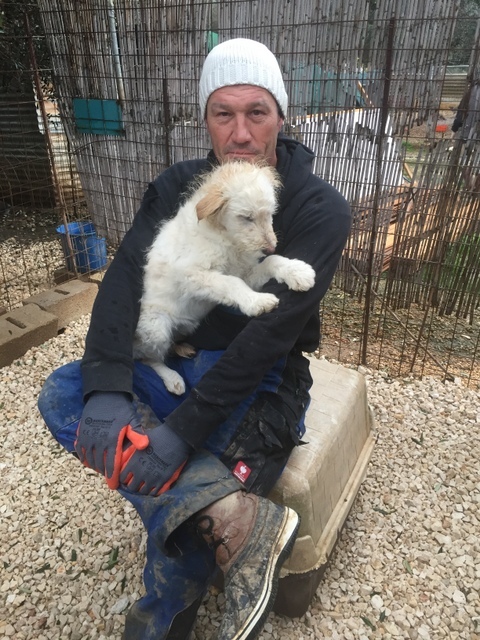 At Christmas 2016 we met two frightened, hungry and unwanted puppies who touched our hearts. Our dream that they would one day be adopted together and live long, happy and safe lives has come true! To our little ‘Whities’ we wish you a very happy long life with your parents Raguel and Rodriquez. 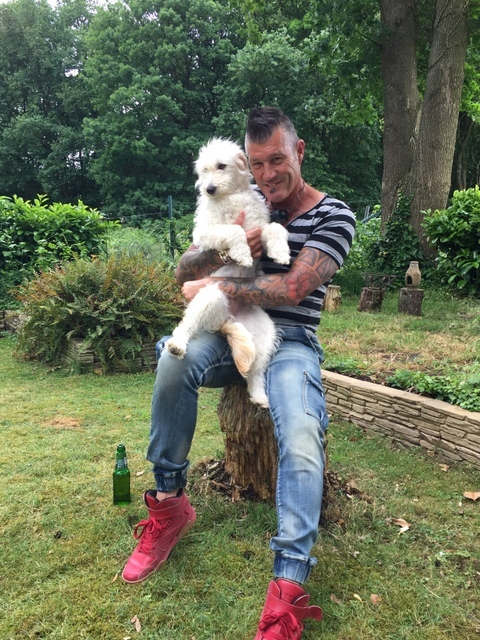 Arno & Consuela sending their love from Holland. Next Post Miro, the dog who survived an earthquake.